These five tips for decluttering your home will empower you. When your home is full of clutter, it can feel overwhelming. But it doesn’t have to be! A cluttered and disorganized home is not only unsightly. It also stresses you out and steals your peace of mind. You may not even realize that it is doing so. But when your eyes are constantly confronted with a lack of harmony around you, it takes a toll. When you are constantly struggling to find things in the mess, it takes a toll. And when you are too embarrassed to invite people into your home, it definitely has a negative effect on your life and well-being. Thankfully, decluttering your home does not have to be a difficult thing. Although it may be time-consuming, depending on how much clutter and disorganization there is, cleaning up your home is completely doable. Here are five tips for decluttering your home. When your home is full of clutter and disorganization, it gets in the way of your life. It is more difficult to get work done. It is more difficult to engage in your favorite hobbies. And it is harder to enjoy a full social life in your home environment. When you begin a decluttering project, keep your why firmly in mind. Do you want to invite people over for a great barbecue in your back yard? Are you anxious to take up scrapbooking and you need the space to do so? Or are you simply wanting to look around and feel happy and pleased by what you see? Whatever your reason, remembering your why will help you stay motivated and inspired at those moments when your project feels a little overwhelming. When things are badly cluttered and disorganized, it can feel like it is taking forever. Focus on one small area at a time and make it as clean and tidy as you can. Be patient with yourself and with the process. Decluttering and organizing your home takes time but as you start to see progress, it will encourage you to stay the course! Pick one area at a time and focus your energy there. Pick up each item that does not belong in that area and quickly make a decision to Give it Away, Put it Away, or throw it away. Put it in the proper box or bag and move to the next item. When the box labeled “Put Away” is full, carry it with you as you put all of those items away wherever they belong. Once the box is empty, return to the area you are focusing on and continue working. When the box labeled “Give Away” is full, set it aside and get a new box for the purpose. The next time you leave your home, take the “Give Away” boxes with you to drop off at your favorite thrift store. This was stated earlier in the article and is mentioned again now because it is so important. Decluttering and organizing your home can feel very overwhelming if you aren’t mindful. When you focus on one room at a time or one small area at a time, it breaks the project down into small, manageable sections. And it more quickly gives you a payoff for all your hard work. Those little spots of cleanliness look so great, you just want to make more and more of them until your entire house looks the way you want! If you know the problem area, you wish to begin with, great! But if you are looking around, uncertain where to begin, the kitchen is a great place to start. The kitchen is the heart of the home. It tends to have the highest traffic, and it is where you nurture yourself and your family with the meals you prepare there. Clean, declutter, and organize that space first. It is an excellent way to reclaim your home and provide yourself with a “command central” type of area where you can plan out the rest of your decluttering and reorganizing efforts throughout the rest of your home. When you make the decision to declutter and organize your home, it can feel a little daunting and overwhelming. 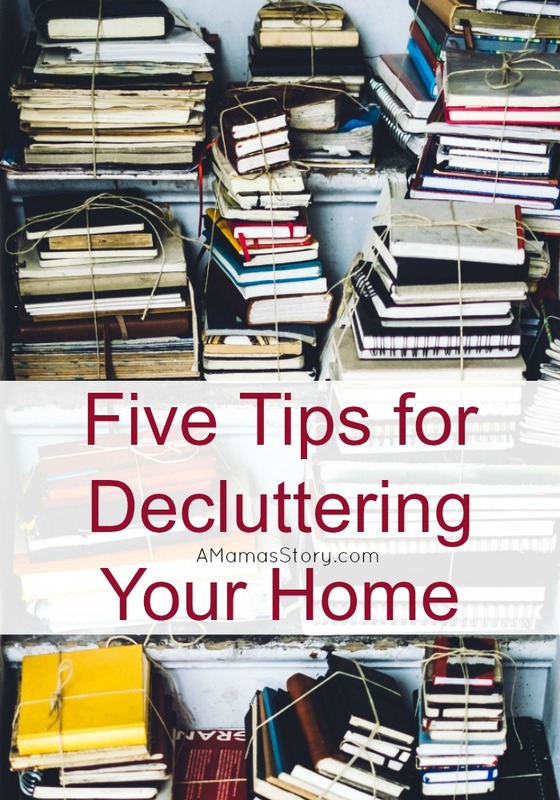 But by following these five tips for decluttering your home, you can get a handle on things and show your home that you are in charge. And when you sit back and see the beauty that you have created, you’ll feel a sense of pride for a job well done. What are some of your favorite tips for decluttering your home? I’d love to hear about them in the comments below! I definitely need to declutter more often! Thanks for sharing! You’ve inspired me. Clutter throws me off mentally, too. All great ideas! I finally hired an organizer for my side of the closet. So serene. I just like walking in. Worth the money! Ha! Great post – will share. I once hired a professional organizer when we lived in a small house with lots of children. The first one just moved around my clutter, but the 2nd one taught me how to purge my stuff, and that was the biggest help. I love the two boxes and a bag idea! That’s how I always sort out closets, etc. Thanks for the awesome tips. Decluttering really can change your life! You’ve shared some great tips here – and I love your point about remembering your why! Thank you so much for sharing and for being a part of Hearth and Soul. Pinning and tweeting. Thanks so much, April! Decluttering is an ongoing process (especially when one has a large family). I used to think getting organized would be the answer – now I know my problem is just too much clutter. Decluttering is an ongoing, life-long process, but it makes such a big difference! Yes! I hired professional organizers in the past. The ones who simply moved around my clutter didn’t help. The one who took my hand and said some of this needs to go, did. This is perfect timing for us. We hit those crazy temps and it’s too hot at 108 degrees to be outside. We have been going room by room. Thanks for sharing at the #InspirationSpotlight party @DearCreatives Pinned & sharing. My goodness, that IS hot! Wow! I like to stay indoors and work when it gets too hot, too. Have fun decluttering! I just love this tip…If you Don’t Know Where to Start, Start With the Kitchen. This is perfect for when you just feel overwhelmed with it all. Yes!! I’ve found that when the kitchen is in a mess, it all just goes downhill and I don’t make much progress. Sara, I love the two boxes and a bag idea! I love how simple you’ve made it! Decluttering doesn’t have to be and shouldn’t be complicated! Thanks for sharing, I’m visiting you today from #FaithOnFire Linkup. Awesome, Debbie! We have to make decluttering easy, eh? It’s an ongoing process. In my case I’d add just one more tip— declutter when the kids are husband are away! I love to clean and clear out clutter but I live with a few pack rats who get anxious when I start clearing out. If they are not around they never even notice the things that are missing but if they see me toss it they complain for days on how heartless I am to get rid of said item (even if no one has touched it in years!). I do find tackling one small area at a time is the key and I just keep working my way through the house in fits and spurts.